Yvette Stanton of Vetty Creations has a great post about Pinterest on her blog. It spells out exactly how Pinterest is used to skirt copyright laws and steal from our favorite authors and designers. Boycott Pinterest! It's a Den of Thieves! © Copyright March 5, 2018 Jane M. Wood. All rights reserved. This month's Smart Cookie Award goes to Cindy, who is working a multi-colored plaid border around her design. Cindy took a few mini quilters clips and glued magnets to the back. She uses them to gather her thread tails on the front until she needs a color from the group again. UPDATE: Brenda's done something similar. © Copyright March 3, 2018 Jane M. Wood. All rights reserved. Yes, Debbie Rowley of DebBee's Designs also has new videos! Hers are on YouTube and are mostly stitch demonstrations, although there's a nice demonstration of how to use a flat iron on threads and a video on how to start or end threads. Have fun exploring! If you aren't familiar with DebBee's Designs because you don't do counted canvaswork, here's her website so you can check out her designs. © Copyright March 6, 2018 Jane M. Wood. All rights reserved. David McCaskill's new website now has videos! The Introduction video and his video on how to read needlepoint canvas are free for all to watch. I highly recommend the "Reading Your Canvas" video as it explains how to do basketweave properly on a canvas and how to decide which end is the selvedge end. More videos are planned but these are going to be available only to the folks on David's mailing list so make sure you sign up for that. To do so, go to Contact Me and then look for the little newsletter sign up box at the bottom right corner of the page. © Copyright March 2, 2018 Jane M. Wood. All rights reserved. If you travel with your stitching to seminars, classes or just to meetings a lot, you'll be interested in the cordless rechargeable flat iron that Brenda found. She gives it a rave review! © Copyright March 1, 2018 Jane M. Wood. All rights reserved. This morning's post by Mary Corbet is a review of a new product called The Floss Inn. Basically this is a traveling project organization bag invented to hold cotton embroidery floss (DMC, Anchor, etc.). I think it would work for other threads, too, as long as they aren't too bulky. It's worth a consideration if you have to travel with your projects often. You can browse the various sizes and fabrics available here, plus watch the little video of a Floss Inn being used. © Copyright February 28, 2018 Jane M. Wood. All rights reserved. The latest Bedecked and Beadazzled newsletter is out and it has a honey of a snowflake background stitch diagrammed! This was created by Robin King and Ruth used it in her last mystery class. It's really a pretty thing. And of course the newsletter is full of Ruth's upcoming classes and news, so have fun reading it and planning where to put snowflakes on your canvases. © Copyright February 1, 2018 Jane M. Wood. All rights reserved. Rachel Donley recommends that her monogram ornaments be displayed on straw purses and totes from either Bosom Buddy Bags or QBS Designs that your favorite shop carries. Looks like you can also order online if your shop doesn't carry bags. If your favorite shop doesn't have these bags but you want to support needlepoint stores, Po's Point appears to carry them. And Stitch Boutique of Boston. Designers like Tory Burch also carries suitable bags for a monogrammed ornament. Check places like Nordstrum's, eBay for vintage and of course Etsy. What's the Point? Needlepoint in Dublin, Ohio is going to have a Rachel Donley class on creating your own monogram which can be used to adorn these purses on April 7. UPDATE: I'm told Cabbage Row Needlepoint in Charleston has both the bags and will custom design a monogram ornament for you. © Copyright February 25, 2018 Jane M. Wood. All rights reserved. Last month I wrote an article listing books that are particularly useful for those doing canvas embellishment. You can find it on my Chilly Hollow Stitch Guides blog. If you know of other books that are really helpful when you are trying to find a stitch for an effect on your painted canvas, please let me know. © Copyright February 24, 2018 Jane M. Wood. All rights reserved. Needle Paint has made some needlepoint slipper designs for customers recently and shows them off on their blog. It's not inexpensive to have the canvas designed and I expect the finishing will be at least two-three times what the canvas costs. But it will certainly be a one-of-a-kind item! Needle Paint's customer recommended George Cleverly in London for finishing. I didn't see any examples of needlepoint slippers on their website. Bowhill and Elliott in Norwich (also the UK) were also mentioned as slipper finishers by Needle Paint. Check under "Slippers" to see examples of their work. While you are shopping you may run across designs printed on penelope canvas and wonder how you stitch on it. Here's an explanation. Penelope normally comes in 10/20 count although you can find 12/24 count. Try working fine crewel wool or DMC cotton floss or size 12 perle cotton on it. It is rougher than mono canvas and the holes are smaller, especially when you split the pairs to stitch smaller detail. Here's more information on penelope including the definition of gros pointe and petitpoint. Needlepoint for Fun also carries penelope canvases. They are generally printed. (I've never seen any hand painted penelope canvases.) You may have seen canvases where the center design is stitched and the background is to be stitched by the purchaser. These are generally on penelope canvas. © Copyright February 23, 2018 Jane M. Wood. All rights reserved. Melita is on the road again, this time visiting Hilton Head Island in South Carolina where she had a lovely time at Needlepoint Junction. If you want to know where the shop is located exactly because you'll be near Hilton Head soon, or if you just like browsing shops from afar, you'll find the Needlepoint Junction website here. Don't miss "Latest News." © Copyright February 26, 2018 Jane M. Wood. All rights reserved. 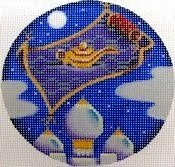 The latest shop e-newsletter from Needlepoint for Fun talks about two stitches to use for water. The stitch they call Water Stitch was created by David McCaskill and is on the ANG website's Stitch of the Month section if you are a member and can log in to see it. I've used it to great effect but it is easier to work in my opinion if you turn the stitch and canvas a quarter turn and work it in vertical rows instead of horizontal ones. Copyright February 23, 2018 Jane M. Wood. All rights reserved. Lorraine of Colour Complements has chosen a fun way to showcase the new thread colors she's come up with for her line of threads for Spring 2018—she's stitching four sections of Laura Perin's Jewel Box with them! If you are especially charmed by one of the diamonds or just see what other colors Lorraine put together to make each one, go to the bottom of the page and click on "Previous Post" to see the details of each of the four. Way to go, Lorraine! Color makes a huge difference, as Debbie Rowley explains so well on her DebBee Designs blog. By the way, I've used Lorraine's overdyed perle cottons and they are scrumptious! The fabulous English needlepoint designer Anna Pearson was sent photographs of a three-fold screen needlepointed with Alice in Wonderland scenes. The screen is dated 1944 and is in all tent stitches, probably in wool, although where someone would find wool thread in wartime Britain amazes me. Perhaps this was started before WWII and the yarns already put aside. Click on the photos for a better look. Thanks for sharing, Anna. This is a great treasure! © Copyright January 10, 2018 Jane M. Wood. All rights reserved. The National Academy of Needlearts has posted photos of the two Best in Show winners at their 2018 Exemplary. Use the right side arrow to see the other winner. © Copyright March 17, 2018 Jane M. Wood. All rights reserved. If compensation drives you nuts, you might be interested in Susan Robert's Compensation 101: The Art of Partial Stitches for Needlepoint. It's the only book that is all about compensation I know about. It is 45 pages long, so it's not a big book. I've not seen it but it's gotten rave reviews from purchasers on NP Nation. Please note this is a Kindle book, so you will have to buy it from Amazon and will need the Kindle app downloaded to read it. 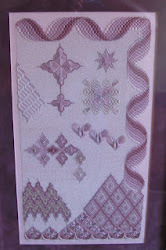 You can visit Susan's Needlepoint Teacher website and check out all her books in the right hand column. All are available from Amazon as Kindle downloads. © Copyright February 22, 2018 Jane M. Wood. All rights reserved. Elizabeth took an embellishment class from Meredith to help her with this Labors of Love Halloween figure and got the tip there. You can see the untouched googly eye front and back in the picture and see how bubbles look with the eye positioned over them. This is what the package looks like in a big box craft store. Basically you peel off the back to create a clear bubble shape and put those on the canvas. Elizabeth is going to try to pierce holes in them to stitch them in place, but I am pretty sure you will need to glue these into position. Just FYI. © Copyright February 21, 2018 Jane M. Wood. All rights reserved. We all have dry spells when stitching is the last thing we want to do, right? Sue Dulle tackles the topic with some great ideas of how to cope when stitching just doesn't seem to happen. Meredith Willet's little spiral bound book, Knots, Fur and Turkey Work, will be available as an app March 15, 2018. It will cost $12.99. You can find a link on The Meredith Collection’s website on March 15, or find it in the app store. I am assuming this is Apple only and available only on iTunes but I don't know for certain. Remember, apps that are not updated as your phones and tablets are updated constantly will cease to work. That's how software is, it goes out of style eventually. Buying an app is not like buying a book. Just FYI. UPDATE: I'm told Meredith has added more stitch diagrams to the app version of the book, which is a nice touch! © Copyright March 9, 2018 Jane M. Wood. All rights reserved. Anna Scott's latest embroidery use metal threads for accents, so she has to figure out how to plunge the ends of this rather fat thread to the back and secure them well. I thought you'd find it interesting how she uses a loop to lasso the end to yank them to the back and then unwraps the metallic foil to secure the back side. Personally I'd be very worried about unwrapping the thread on the back as it might start to unwrap on the front but all this is food for thought. After all, we have wired threads and beading wire, not to mention goldwork threads, to handle in our stitching lives. Mary Agnes of Needle Nicely has lots and lots of needle minder magnets! So she found a unique way to display them. Of course this won't work in certain types of houses, so you might want to browse magnet boards. There's even an Etsy store that specializes in all sorts of them! For the thrifty at heart, I've heard of folks using their sheet pans to display magnets. When you are a collector, you need your collection out where you can enjoy it, right? Hope you find just the right display area for your collection of cute magnets for your stitching until the next time you need a set for your current project. The National Academy of Needlearts (NAN) is having their yearly get-together and exhibition of needlework March 16-20 in Troy, Michigan. Everything is happening at the Somerset Inn. If you are in the area, this is a fabulous opportunity to take classes and see the Exemplary, which is NAN's exhibit of needle art. If you aren't going to be able to get to Troy, you can see past award winners online. © Copyright March 13, 2018 Jane M. Wood. All rights reserved. Mary Corbet goes over French knots, with tips on how to make nice ones. © Copyright January 5, 2018 Jane M. Wood. All rights reserved. Debbie Rowley of DebBee's Designs talks about Rhodes stitches and how to tinker with them to make their top stitch slant the way you want. Then she takes on Waffle Stitch and explains how the various shapes of waffle stitches are made. © Copyright February 20, 2018 Jane M. Wood. All rights reserved. I just re-read Kurdy Briggs' description of the cheap wearable light/magnifier she uses and looked them up on eHobby. Here is what Kurdy uses. She's the brains behind Threedles Designs' charts, by the way. If you need prescription light/magnifier glasses, you'll want to check into CraftOptics. Note that the light is a separate option from the prescription glasses with magnifier. Everyone's eyes are different. Some folks need just a good light, some want a light/magnifier combination. Whatever eyes you have, treat them well and use good lighting of some sort. © Copyright January 20, 2018 Jane M. Wood. All rights reserved. The Needlepointer included a video tour of the latest items in the shop in their last newsletter. It's a fun browse to see their new line of totes and visit some of the Kelly Clark trunk show. A Thread Garden/Bead Time has opened in their new location! Here's all you need to know to visit the shop if you happen to be in the Newbury Park, California area. © Copyright March 8, 2018 Jane M. Wood. All rights reserved. Since we are always looking for a perfect lamp for our stitching, I thought you'd like to read Mary Corbet's summary of the light brands she uses herself. She describes the situation she uses them in and why she likes them very well. Of course, your stitching needs and Mary's will vary, but as always her reviews are very helpful as we look for The Perfect Light. © Copyright February 12, 2018 Jane M. Wood. All rights reserved. The blog for the Embroiders Association of Canada has a very interesting short introduction to Ann Bernard's blog, which talks in detail about various embroideries that record and explain history. A great many folks who visit Blog are interested in the Bayeux Tapestry, and Ann deals with it in detail here. Remember, this is a blog, so the entries are latest on top. This is the first. You'll have to follow along to understand Ann's points about the embroidery and the history it illustrates, so scroll all the way down to the bottom of the page and click on Next Post to read the entries in the order they unfolded. Please note that Ann talks about other historical embroideries as she tells the story of what happened in England in the pivotal year 1066. Brenda has become enamored with rozashi, a 7th Century Japanese style of embroidery done on a special ground fabric called ro. Brenda's been taking classes from Margaret Kinsey, whose website is here. This is the page on rozashi but there is more here for the curious needle worker. Have fun exploring. 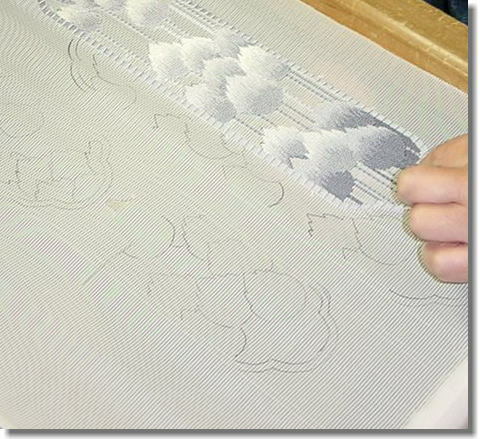 I found two photos of rozashi being worked that shows the ro fabric well. This is from a Japanese site. This is from a blog that appears to be defunct now. But the photo is revealing. I hope you enjoyed seeing a totally different style of stitching. It's always fascinating to see what other needleworkers do. 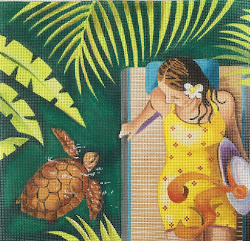 Needlepoint For Fun has a great background stitch diagrammed in their latest shop newsletter. It is called Open Squares and it is a light coverage stitch. It will make a great lace curtain or a tablecloth if you need a stitch for that, and it is also a nice all-over stitch if you want to cover your canvas with one stitch in a metallic for a specialty look. It also will let the intricate shading in a background show. The key to this stitch, like all darning stitches, is to use a long enough length of thread to get to the end of a row, and to secure each row well just outside the design area. © Copyright February 9, 2018 Jane M. Wood. All rights reserved. Waste Knot in Arlington, Virginia is getting ready to move! So if you are planning to visit the shop as part of your trip to Woodlawn, get there before the middle of March. The shop will stay open at its current location through March 17th. They will be closed through April 1st and hoping to reopen on April 2nd. The new address is 2100 N. Glebe Rd., Arlington, VA and is right around the corner from the current location. It is right next to Papa Johns and Sherwin Williams. Waste Knot's phone number will remain the same. © Copyright March 4, 2018 Jane M. Wood. All rights reserved. I've added a third tutorial on how to embellish a painted canvas to the Chilly Hollow Stitch Guides blog. You'll find it here, or you can read all three articles by picking the right tabs at the top of the page under the header photo. As usual the shop newsletter for Louise's Needlework is full of good information. I highly recommend the article on bead sizes for those who are a new to putting beads on needlepoint canvas. and Karen's article about how she created dimension on her latest needlepoint canvas is enlightening! © Copyright 2018 Jane M. Wood. All rights reserved. Cynthia in Houston has a nice tutorial about painting your own canvases on her lifestyle blog. If you ever wanted to try this, check it out. There are other paint-you-own tutorials in one of the tabs above, too. So read all about it, and then try it! © Copyright February 7, 2018 Jane M. Wood. All rights reserved. Fiber Talk is at the Nashville Market doing videos of the exhibitors. Besides interviewing sampler and counted thread folks, they also talked to Doug Kreinik, Debbie Woodward/Painted Pony and Kathy Rees/Needle Delights Originals. Gary and Christine have done a lot of other booth interviews with sampler and counted thread designers. If you'd like to browse those, go to their main page and explore. UPDATE: The fun continues as Gary interviews more folks at the Nashville market. This set of videos includes an interview of Julia Snyder of & More. This video grouping includes an interview with the maker of Rolaframe frames and stands. This set has an interview with Raymond Crawford and the Hug Me Bags folks. The final set of videos are all about Treenway Silks. Thanks to Tricia Nguyen of Thistle Threads, I learned that there is an online collection of free blackwork patterns to download, created and uploaded by Kim Salazar of the String-or-Nothing blog. It is a fabulous resource for a background pattern, for clothing or just for a fun doodle stitch when you are experimenting with a new thread. Double running stitch is quick and easy to master and it is fun figuring out a path across the patterns with double running. Enjoy this great resource. © Copyright February 3, 2018 Jane M. Wood. All rights reserved. Accoutrement Designs reminds us that they have magnets that coordinate with the Go Red with Thread canvases that raise funds for heart disease. © Copyright February 2, 2018 Jane M. Wood. All rights reserved. Remember last week's posting about the Snag Nab-It? And the giveaway, sponsored by Jane B.? The contest ended yesterday, so I collected the names and asked Jane to draw one out of a hat. (Ok, well, she picked a random number and I counted down the list until we found the winner's name, but you get the idea.) The winner is…. Congratulations on the win, Dawn. Could you please email me so I can tell you where to send the stamped, self-addressed envelope? I am at chillyhollow at hot mail dot com. Actually, only a little of the mystery has been revealed. The mystery class at Bedecked and Beadazzled for Spring 2018 will be this lovely bird and polka dot-themed piece from Ellen Giggenbach. It's called Fantail. What Ruth will do to embellish it is To Be Revealed…. I'll update this as Ruth pulls rabbits (and bling and ribbons and all other forms of fun) out of her hat. To start, Ruth does Jessicas! And there is a link to a video to show how to make Jessica stitches. Ruth continues adding circles to the design in various interesting ways. All Dotty! Ruth then manipulated stitches and added a flower on top in two places. And now we have silk ribbon leaves! Looks like only the bird is left…. And we are done! Now we have to wait to see how Ruth finishes this.